Do budget PC upgrades provide bang for buck? Will upgrading your graphics card give you the performance increase you are looking for? There comes a sad time in every computer's, often short-lived, existence where it's just getting that little bit too lethargic to be a functioning member of your computing community. It can be a depressing time, seeing your once sprightly machine weighed down by the demands of newer code and shown up by even newer hardware. The joy of PCs, though, is that with a judicial hardware upgrade your once lightning-fast, but now lumbering rig can get a new lease of life for a fraction of the cost of buying a new machine. That's not to say that you shouldn't throw your bones at a full rig. When the cost of upgrading involves having to buy a new motherboard and RAM to accompany that new processor, then the price can soon start drifting north of £400. In this case you might as well take a look at some of the more bargainous system integrators out there, as they can get it cheaper. But where do you look to upgrade first? Well, it depends on what you primarily use your PC for. Is it a media PC hooked up to a large-screen TV? Or Is it expected to handle 1080p movies, encode an assortment of other video content or be the centre of your media life? Or maybe it's your gaming rig? We've taken two old base rigs languishing in the darkest recesses of our office to represent two different upgrade paths. On the one hand, we have a thoroughly old school AMD socket 939 machine, with an Athlon X2 4800 and an Nvidia 7900GS, and on the other hand we have a 2GHz Core 2 Duo rig with the DirectX 9 card de jour, the Radeon X1900XTX. The AMD rig represents a mid-range machine and the Intel a high-end PC from yesteryear. Are these machines better served by a series of incremental upgrades, or are you better off passing such systems off to less clued-up members of the family so you can buy yourself a new machine? So where do you start when you want to get some more gaming performance out of your machine? If you're like us, the humble graphics card is the first thing to pop up on your radar. That's right, rip out the old graphics card and slot in a shinier, bigger, newer, pixel-pushier board and you're laughing, right? Well, kinda. The difficulty with upgrading versus just buying a whole new rig is that nine times out of ten you are having to battle against bottlenecks in your existing system and locating those choke points is going to pay dividends when it comes to choosing your upgrade. Our base system, the Intel 2GHz dual-core chip with an X1900XTX would have been the darling of the gaming world a couple of years back and would've probably cost around a grand for the privilege. Now the 1900XTX still manages reasonable frame rates on relatively high settings, so it shouldn't take too much experimentation to get this rig rocking again. For our first upgrade we've selected Nvidia's affordable 9600GT. This Palit Sonic, overclocked edition is yours for a mere £77 and it's pixel-shunting power is well documented - it' may be a little old now, but it can offer a serious boost in the right system. Unfortunately, it hardly garnered much of a performance increase at all over the base X1900XTX, gifting us a maximum of 8fps in GRID and around three or four frames in the other two games. We'll freely admit that we expected more from this card, especially as it has served us so well in the past. Rolling in at just over the £100 mark, the next upgrade of choice is the Radeon HD4850. Again this is a quality DX10 card for the money, and is capable of pushing out pretty polygons at speed. Unfortunately this gave us no extra performance, either. In fact, we saw performance drop compared to the 9600GT, in World in Conflict. It's not the mid-range card's fault, however, as once we dropped in our top upgrade card, the excellent Gigabyte GTX260 OC (similar to the Zotac GeForce GTX260), it suddenly became clear that the performance bottleneck wasn't the graphics card. With only a couple of extra frames per second for a whopping outlay of £200, this clearly isn't where your money should be going. Part of the problem here is the constraints of the motherboard itself. The old school 650i board just can't cope with amount of information that the high-end graphics cards are trying to push through its ageing pipes. But the other problem is the weak processor ticking away at the heart of the system. Replace the processor though and you would see performance increasing by at least ten frames per second with a 9600GT card and most likely doubling if we were to slot in the GTX260, the top upgrade card. Unfortunately, once you start looking at making an upgrade to your system it generally only serves to highlight the rest of the problems with the old technology residing in your rig. There's no easy quick fix for this either, a new GPU will give you a few extra frames, but to make a real difference you need to change at least two components. In this case the processor and graphics card. This in turn may need a new motherboard, and in turn new memory, but either way, spending anything on graphics for this rig is a waste. Upgrading this Alienware rig is akin to Indiana Jones entering a dusty cave and uncovering hordes of lost treasure. The young(ish) Harrison Ford-era Dr Jones as well, not the one in the most recent film, who appeared to be doing a parody of the king of spoof, Leslie Nielsen. This Alienware rig looks a bit like one of the fetid crystal skulls as well, being one of the subtle-as-a-sledgehammer rigs from a few years back. Who knows what tech-beasties lurk within? The first part of the PC to get the upgrade treatment is the graphics card. Possibly the easiest part of any computer to upgrade, jamming in a new pixel pusher can also give the most noticeable results. If you're running Vista on a non-DirectX 10 card you'll also notice those subtle effects when you upgrade straight away. A three-year-old Nvidia GeForce 7900GS was my starting point. This card could run the evergreen GRID smoothly enough, although it limited the resolution to 1,280 x 1024. However, it was a different story with Far Cry 2 and World in Conflict, but then we would expect them to crawl along more glacially. This particular card is still available for about £50, although we'd recommend getting a cheapo DirectX 10 card if that's your budget. The first step up was ATI's superior X1900XTX, a contemporary competitor to Nvidia's card. Frame rates were somewhat better with this card, and GRID happily ran at higher resolutions. We still couldn't get Far Cry 2 to run in anything above medium detail, however. Leaping up the wonky upgrade ladder of doom, we came across the 9600GT. Again, frame rates grew: World in Conflict and GRID breached the crucial 24fps watermark in maximum settings, although the more-intensive Far Cry 2 couldn't muster this feat. On to the competition, namely AMD's HD4850. 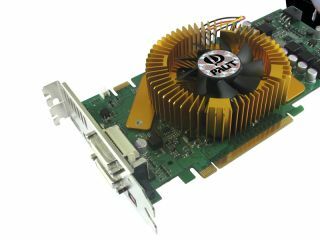 This card managed to drop a few frames at lower resolutions, but turned out to be a heavy-hitter at maximum settings, where it almost doubled some of the 9600GT results. At this point, the effect of successive graphics cards being repeatedly rammed into the test machine pretty much topped out. We did try AMD's HD4870, which comes in at about £50 more than the 4850, but it failed to offer any noticeable improvements in the game tests. Next up was Nvidia's behemoth of a graphics card, the GTX 260. It's priced at over £200, and barely fitted in the machine. We had to reconnect the exhaust fan to another port on the motherboard, which resulted in ominous sparks and smoke firing out of the PC whenever it was turned on. Strangely enough, it reminded us of the dodgy ending to the last Indiana Jones film, except no heads exploded. The GTX 260 offered a slightly better increase in frame rates, but not enough to justify spending so much on a graphics card trapped under the glass ceiling of the ageing motherboard and processor. The 9600GT is the clear winner for this rig, at least for the cash outlay.